We’ve all heard the story – a young child is presented with a choice. One of them leads towards a life of glory, while the other sends them spiraling down a path of darkness. It’s a single, monumental decision that can define an entire life. In between the beginning and the end, however, there are innumerable choices that get forgotten. It is really these smaller choices that truly shape a person’s legacy. A single decision doesn’t necessarily have to define a person; we all fluctuate between ‘good’ and ‘bad’ choices throughout our lives. Call to Adventure is a choice-driven game where players are selecting traits and overcoming challenges to shape the life of their character. As the characters gain additional experiences, your choices have greater scope and scale. Eventually, you’re left with a complete story. Origin – Cards like ‘Apprentice’ and ‘Merchant’ that describe your character’s beginning. Motivation – What drives your character? Includes cards like ‘Thrill Seeker’ and ‘Bound by Honor’. Destiny – At the start of the game, this one is kept hidden from the other players. This is where your character will end up; you get to choose how they get there. Will you be a ‘Hand of Fate’? What about a ‘Force of Darkness’? The scoring is done at the end of the game. Players earn points by playing cards to their character tableau, collecting matching story icons, ending the game at a certain place on the Corruption track, and having experience points. Over the course of three Acts, players are going to take turns selecting a trait or challenge card from the table. A trait can be taken if the criteria is met, whereas a challenge requires the character to overcome it before they can be taken. To complete a challenge, the player must choose which path the character will take, which is generally going to be a ‘light’ or ‘dark’ decision. Then, the player must roll runes, hoping to roll well enough to beat the challenge. Losing awards experience, which can be used for various in-game reasons. As players make decisions and begin to fill up their tableau, they’re going to be progressing on the Corruption track. This limits the types of cards that can be played to interact with the other characters; the more corrupt a character becomes, they lose the ability to play Hero cards and vice versa. At the end of the game, players are encouraged to weave the tale of their character’s life through the cards that they’ve collected. It’s your opportunity to put the pieces together and tell a unique story about your character. For example, you might tell the story of Cecelia, the sorcerer’s apprentice who dabbled in the dark side hoping to find power. Instead, she found herself in captivity and spent the rest of her life seeking revenge on those who did her wrong. CThe components in Call to Adventure are well-made and sturdy. Games with player mats can go multiple ways: thin like Terraforming Mars, or thick like Scythe. These mats fall squarely in the middle, offering the necessarily quality to hold up for dozens of plays. Likewise, the cards have a nice finish, which is huge plus. What really sells the game, however, are the clay runes that are used when attempting challenges. 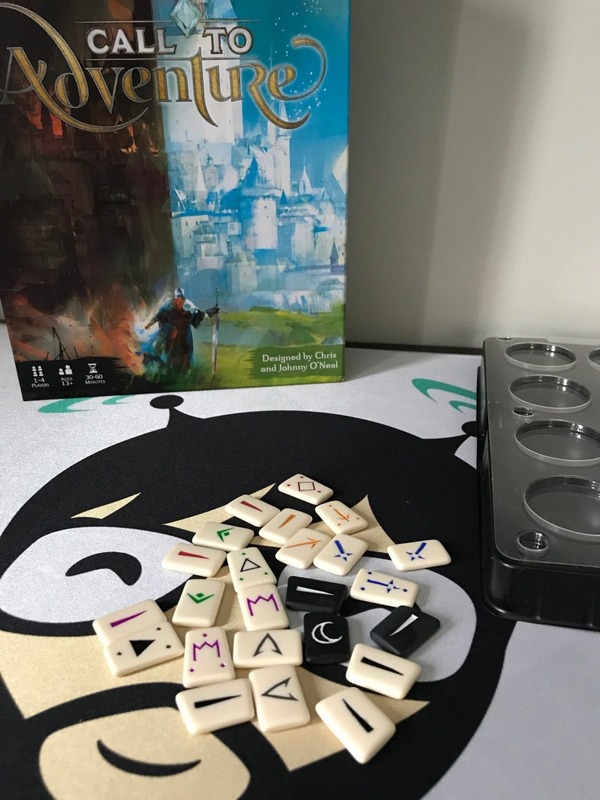 With their satisfying weight and feel, these runes help sell the idea that players are ‘rolling the bones of fate’ to determine the future of their characters. The rulebook, although high quality, feels a bit sporadic at times. There is a quick play guide on the back, but I didn’t realize that until I had read through the entire booklet. This guide is really the bread and butter for teaching the game to new players. With the multitude of rune symbols, story icons, and card text, the initial presentation can seem daunting and complicated, but the quick start guide provides an adequate base for play. I’d recommend starting there. Rolling the runes is the primary mechanic of the game, and the real crux of Call to Adventure. There is decision-making in the card-selection for challenges and traits, but most of the time you’re going to be performing some mental calculations to see which cards you even have a chance of successfully adding to your player mat. Now, players have the control to choose cards that they have the best odds of succeeding against, so everything doesn’t rest on Lady Luck’s shoulders. Picking a wide variety of cards grants more freedom and less worry about failing challenges. Since the game plays quickly, every roll has narrative weight. Taking risks and playing conservatively are both supported playstyles. Dice-based games of chance aren’t my favorite, but I’m a big supporter of putting things to chance with a risk/reward attitude when I have the chance. It would be nice if failing challenges had a consequence. That might be my biggest qualm; I want my choices to have more meaning in that regard. I’ve seen mixed-bag reviews about the art for this game, but I’m firmly in the camp that enjoys the aesthetic choices. From my perspective, the cards completely embody the generic fantasy setting. The blurriness of the style creates the feeling that we’re looking at portraits of deeds immortalized in time. For a game centered around decision-making, it makes perfect sense. The overarching color choices for the various runes tie well into the player mats and cards. By using the crescent moon as a symbol for corruption and a blazing sun for ‘piousness’, the designers are capitalizing on associations that people inherently share. The runes also give me substantial Witcher vibes as well. Everything is rolled up into a smart package that doesn’t lead to any confusion when putting the game away. This is an underrated positive, especially for someone who is still struggling to figure out the best way to fit everything into Scythe’s Legendary Box. Throughout the course of the game, the other players are choosing cards off the table that you might have had your eye on. Although there are some Hero and Antihero cards that impact others, there isn’t much player interaction in Call to Adventure. With that in mind, I’m always eager to hear the stories at the end of the game. Everybody will have a fresh perspective on the cards that they selected. A single card can have a multitude of meanings depending on who’s holding it. Competing for the highest Destiny score (ie. Most points) provides the competitive definition for this to be a game, but the real treat lies in the narrator abilities of your friends. I can see how playing the game ad nauseum could lead to the stories getting stale, especially if the same cards are being chosen. However, the opportunity for expansion content is ripe for the picking. Between new cards, allies, and adversaries, a bunch of content can be injected straight into the game. In a game like this, where you’re building a character who is progressing towards their destiny, it’s important to set the tone early and often. Luckily, Call to Adventure succeeds in setting the stage for the individual narratives of our characters, and grounds us to their stories. One of the best ways this is accomplished is through the three Act progression system. As your character gains life experiences, future challenges become more daunting. Sure, you can try to overcome a particularly difficult adversary earlier in the game, but you’re going to need a boatload of luck on your side to do so. Rolling the runes to determine outcomes also creates the illusion that the players are master manipulators of fate. Every result is dictated by the players, and only the events that are meant to be will come to pass. Maybe the game should come with a pair of scissors so we can pretend to be the Fates from Hercules. With all that description out of the way, we’ve reached the point where I stake my C.L.A.I.M. on Call to Adventure! Everybody loves a good story, and you can play your hand in creating a masterful tale with this game. The story possibilities aren’t mathematically ‘endless’, but let’s just say it’s a high number. Some things are just set in stone. Look for Call to Adventure at your FLGS! Otherwise you can find it at Amazon, here.